Spokesman for the Russian Defence Ministry Igor Konashenkov gives a briefing on US strikes against Shayrat air base in Syria last April. A spokesman for Russia's Defense Ministry said on Wednesday that a series of attacks launched by Islamic State in Syria on government forces had come from an area near the border with Jordan where a U.S. military mission was located. 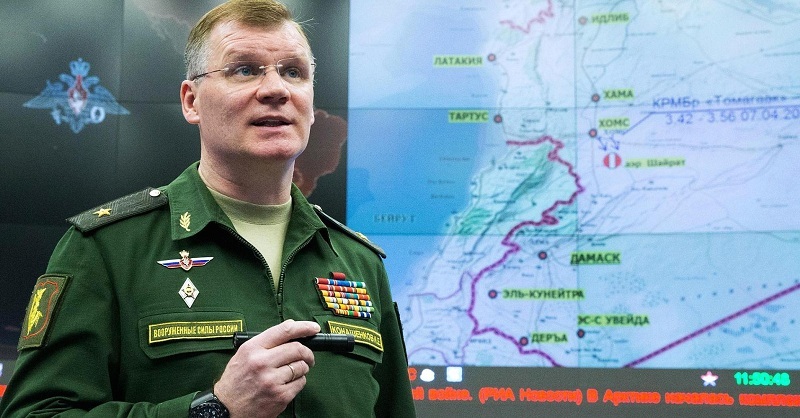 The spokesman, Major-General Igor Konashenkov, said in a statement the attackers had the precise coordinates of the Syrian government forces, which could only have been obtained through aerial reconnaissance. "If the United States views such operations as unforeseen 'coincidences,' then the Russian air force in Syria is prepared to begin the complete destruction of all such 'coincidences' in the zones under their control," he said. "The main obstacle to completing the defeat of Islamic State in Syria is not the military capability of the terrorists but the support for them, and flirtation with them, by the United States," Konashenkov said.